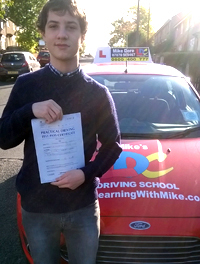 I have been with Mike 36days, 40hours and passed my driving test first time with 3/15 minors. Mike was very flexible with booking in my lessons and did weekends on request. During my lessons he adapted to the way I learn as I am dyslexic and would mix up my rights and lefts. Mike can be relaxing, calm and very informative. 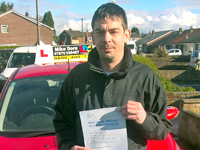 I recommend Mike as a driving instructor as he is very thorough and has a friendly approach to learning. Mike also gave me a book and DVD for my driving before I started which was very useful. 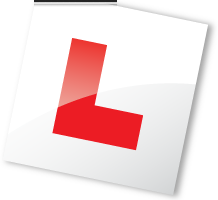 I will be continuing with Mike for motorway lessons and pass plus. Thank you Mike. Mike is an excellent instructor, calm, composed and professional. 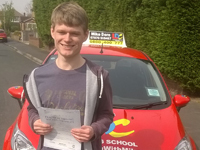 Without his help I wouldn't have passed first time with 1 minor. I would recommend Mike to everyone who is learning to drive as he is not only a great driving instructor but person in general. 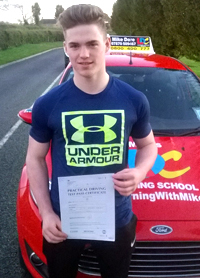 Congratulations to Niall for passing his driving test. 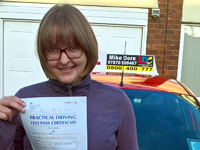 I was already a pretty experienced driver with numerous different instructors and had already taken 2 tests. When I moved to this area, I saw Mikes name on Facebook and I contacted him. 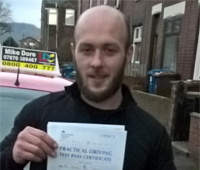 He booked me a lesson within a few days and I never looked back and managed to pass first time under his tutelage. 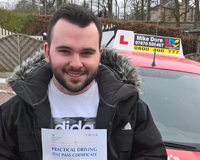 With an extremely calm teaching style and an upbeat fun attitude I would recommend anyone to learn how to drive with Mike. I found Mike after asking around on Facebook of good local driving instructors, I reached out to Mike to arrange the best dates for me as I was away a lot at the start of my lessons and he replied almost instantly informing me of the times and dates he had available that fit into the timescale I had planned and he concluded I should do the semi-intensive course. When I first met him, he was easy to get on with and his teaching style met my needs and he also explained a lot of what we were doing and why it was important to me. He was quick to identify my strengths and weaknesses and therefore planned lessons to focus more on my weaknesses so that I would improve rapidly. After spending 16 hours with him I had to go away for 3 months but after that we picked straight up from where we left off because of his patience and teaching style he ensured I was more than confident and with a few more lessons I was ready to take my test. 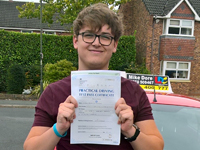 Due to this I can highly recommend Mike as a driving instructor in the Chorley area as he was always on time and if there was a reason, he was late he would carry my lesson over so I had the full 2 hours which I appreciate as I know there are a few instructors who wouldn’t have the same patience. 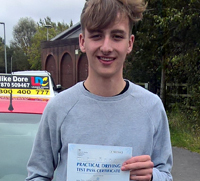 Congratulations to Maris for passing his driving test. After finding Mike on an internet search I quickly gave him a ring and immediately found him very easy to get on with. We decided on a double lesson each week. Mike quickly identified my strengths and weaknesses and soon had me up to scratch, although I had to take an extended test Mike reassured me that he had every confidence I would pass. Overall, I would say that Mike is easy to get on with, punctual, good at making you feel relaxed and loves a good chat. I highly recommend him. Mike is an absolutely lovely and caring instructor who goes above and beyond to have a relationship with each of his pupils. 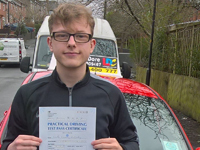 He is extremely patient and ensures you are not just prepared for your driving test but also for driving once you have passed your test. Each week he allowed me to improve my driving and my confidence in my ability. 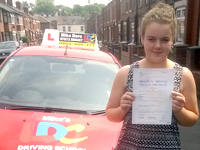 I can highly recommend Mike as a driving instructor in and around the Chorley area. Thank you for everything Mike, you have made learning to drive enjoyable. I started with mike having had lessons a few years earlier and he helped me get back up to speed with my skills in the first lesson. As he couldn’t quite do the normal routine that he does with his other students as I have learned before he was able to alter his lessons to suit me. He is calm and easy to get along with and I would highly recommend him! I started with Mike about 1/4 of the way through, and wish I had started with him. Mike helped me realise I needed to improve my observation skills significantly and quickly. Later into our lessons the problems were just me being overly quick, but Mike was patient with me and helped me understand use of speed. The time in the car was always a good laugh and was something I looked forward too. 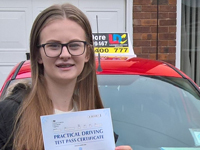 When I went to take my driving test Mike told me to treat it as just another day driving with him rather than being nervous about what could happen, that's what I did and I passed first time with just 2 minors. Mike made me so confident behind the wheel as soon as I got home, I got in another car and drove away with my pass certificate. Once again, big thank you to you. You were a fantastic instructor and I enjoyed every hour in the car with you. 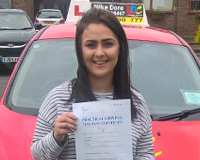 Congratulations to Courtney for passing her driving test. 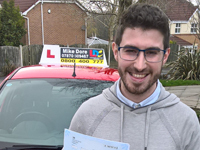 I came to Mike because I couldn’t book a practical driving test with my previous driving instructor and I'm glad that I chose to take lessons with mike! In every single lesson there was always so much to take from it like advice, tips and excellent guidance if I needed it. Mike lets you first approach a situation such as parking into a bay and lets you find a way that suits you best and which is most comfortable to you the student, but he is always there to help. Sometimes when I would mess up or not do my best he always took care of it in a slow and calm fashion to get you back to your peak driving ability and if that doesn't help he also has Polos at hand to give you. Overall, I'm happy that I passed my driving test with Mike he is an outstanding instructor. When I was learning with Mike, I hadn’t had any prior driving experience and put a lot of pressure on myself to learn straight away. Fortunately, Mike is a very patient and reliable instructor who I found to be trustworthy and easy going. 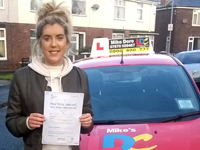 As a learner, I found some new situations to be stressful, however Mike always instilled confidence in me allowing me to pass my test as a confident and safe driver. I would highly recommend him to any new driver! Thanks again Mike. I have been with Mike from the start to finish of learning to drive, and it's fair to say he has been great to be with! He never once got frustrated with me, even if I did make mistakes from time to time. It's been a real pleasure from start to finish and I passed first time with his help! Thank you once again Mike. 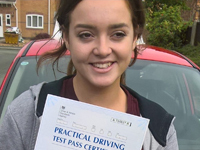 Passed 1st time with no driving experience beforehand. Mike is a great driving instructor and really made me feel relaxed behind the wheel from day one, which allowed me to learn at my own pace. Mike is very kind, patient and easy to get along with and I can’t thank him enough. The 2 hours of lessons felt like the right length of time as the first hour would always fly over, I would come away from each lesson more confident and looking forward to the next booking. I’m going to miss my driving lessons with Mike who felt more like a friend than my driving instructor and I would definitely recommend him to any new driver! Thanks Mike for getting me through my test first time and also teaching me to drive safely. I’ll always remember “He who hesitates is lost”. From one Mike to another Thanks for everything and all the best in the future. Mike is an exceptional driving instructor. 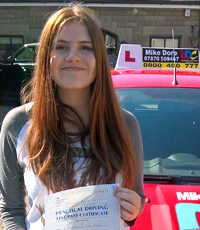 I came to Mike after having bad experiences with 2 driving instructors prior to this. Mike taught me everything I needed to know for the driving test in such a short amount of time. Mike is an amazing driving instructor and we surely had a good laugh during our driving lessons. If it wasn’t for Mike I wouldn’t have passed for sure! Thank you so much mike you’re definitely the best driving instructor in the whole of England. Mike is patient, professional and most importantly articulate in his approach to teaching. 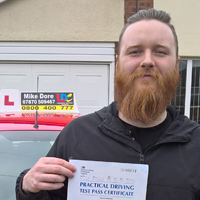 Mike would never over complicate things and structured my lessons so that I could concentrate on the areas of my driving that needed improvement while remaining in line with what I needed to know to pass the test. Mike was also very versatile in his approach and I was able to learn at my own pace and never felt pressured to attempt anything that was beyond my capabilities. It's obvious to me that he takes great pride in his work and I highly recommend him to all learner drivers. I found Mike to be a very encouraging driving instructor. His lessons were always focused, but also relaxed. I passed my test first time after having only been learning for 2 months. I feel that Mike did not just help me to pass my driving test but taught me to be a safe, considerate and confident driver, at the same time as preparing me for the test. I would highly recommend Mike. When I was learning with Mike, I had no prior driving experience and I put a lot of pressure on myself to learn straight away. Mike helped me to relax behind the wheel and have patience with myself, and to learn at a pace that was right for me. Mike’s friendly demeanor and constant encouragement made his lessons enjoyable and I always felt that I had progressed after each lesson and had become more confident in my ability. 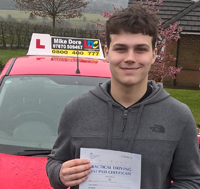 Mike’s emphasis on observations and reading the road put me in great stead for passing my test and for driving safely thereafter. I would definitely recommend Mike as an instructor. 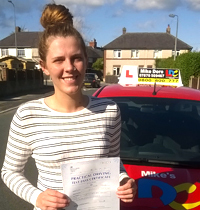 Congratulations to Maisie M for passing her test. Mike is super friendly, reliable and definitely adaptive! I started with Mike only a few weeks ago with prior driving experience, my driving was ok but in the wrong order, I kept riding the clutch and just kept doing silly things like not checking my mirrors at the right times! As I worked away a lot, Mike was very patient and adapted his teaching techniques to what works for me. My lessons were always fun and constructive and we made them count! He always asked what I wanted to do on lessons which I really appreciated. Some days I wanted to practice getting roundabouts perfect and others I wanted to reverse around a corner all lesson. We ironed out all my bad habits in as little as a few weeks and I passed first time!! I was very nervous the day before my test but just taking deep breaths and counting to 5 really worked for me! Thanks Mike! 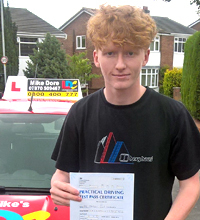 I would definitely recommend Mike to anyone with or without experience behind the wheel. 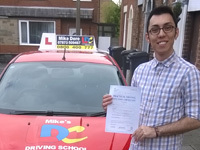 Mike is an extremely trust worthy and reliable driving instructor who never fails to turn up on time. He always turns up in a positive mood, with good intention to get the best out of the driving lesson. He is willing to teach what he and yourself think is best, and what you will achieve the most out of. Mike's ability to consistently make you aware of dangers on the road, whilst teaching and reminding you how vital observations are, are exceptional. He always stays calm in any situation and is extremely supportive and provides outstanding guidance. His car is great to learn in, and any new driver learning with Mike is bound to feel comfortable and welcomed to the road. 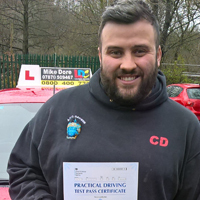 Mike is a reliable, calm and adaptive instructor who's always able to focus on your personal driving style and ability level, structuring it accordingly to ensure you become a safe, correct driver. 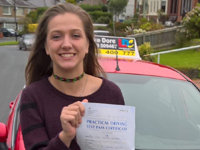 Always on time, respectable and with a cheerful attitude that beginner drivers need to encourage them to join the roads with confidence. His minor checks of attention and awareness along the way keep you on your toes, allowing you to be prepared for uncommon situations on the road whilst reminding you of the dangers and consequences involved. I would recommend his services for any new driver who wants a friendly face of support as they learn and develop their driving skills. Mike is a great driving instructor, very professional. Mike made me feel at ease from day one, was sociable and made me feel comfortable behind the wheel. His car is great to learn in. Mike is very flexible he collected and dropped me back at college to fit in with my studies. Thanks Mike for your patience, help, guidance and support. Matt. 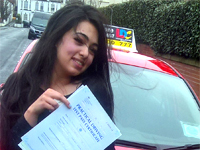 Congratulations to Fifi for passing her driving test. I highly recommend Mike as a driving instructor. He is a genuine individual who loves teaching and making a difference to others. Mike is a friendly, kind and patient individual, who made me feel at ease when driving. I was originally a very nervous learner and now I am an independent driver. 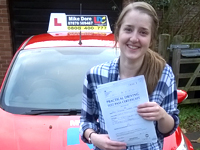 The driving lessons using the LD system were very enjoyable and something I looked forward too. I will always remember his phrases when driving “she who hesitates is lost” and “you must be able to stop within the distance you can see to be clear ahead”. Thank you, Mike, for helping me achieve this goal and become a safer and a confident driver. Mike is very patient, genuine and punctual. If you are somewhat nervous like I was, Mike is a great help in building your confidence and will adjust his techniques to best suit you. I failed first time due to a silly mistake (3rd to 2nd, instead of 4th gear, ouch!) 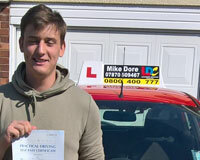 but Mike was very supportive and within 3 weeks I have now passed second time with only 3 minors. After initially starting with Mike, I had to take some time out from lessons due to other priorities, but picked back up with him at the beginning of this year. For both sets of lessons I have done, he has been very flexible with dates and times of lessons and has been understanding when work commitments have interfered with lessons. The car is also very easy to drive and Mike always keeps it in immaculate condition. It's a great car to be learning in. Thanks very much for your patience and understanding throughout, you have been great. 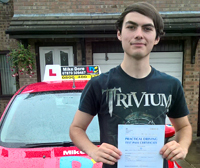 I can't praise Mike enough, he has been a great driving instructor. I took the 30 hour intensive driving course. Mike was very flexible with my lessons and always tried to accommodate my time schedule. He would pick me up from college or from home and was always punctual. When I was setting up my lessons he came to my house and discussed all the options with my parents. I decided to take two hour lessons. 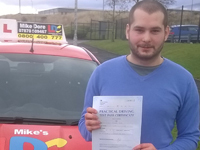 Mike was very patient and helpful and I found that I was always relaxed and made to feel at ease when driving. 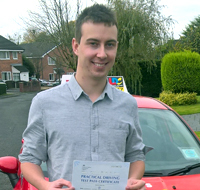 I would like to take this opportunity to thank him and to recommend him to anyone seeking a great driving instructor. I really enjoyed learning to drive with Mike. Thanks for all you have taught me and for helping me pass my test. I would highly recommend Mike as a driving instructor. I find it important to be able to communicate with people as it makes me feel less nervous. 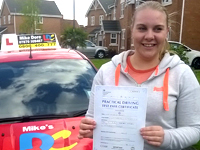 I found Mike was able to make me feel confident within myself which I never had before in a driving instructor. I never felt under pressure with Mike and he let me go at my own pace I think this is extremely important for a driving instructor to not push you but to encourage you. I had little driving experience and booked a semi intensive course which was the best thing I ever did. 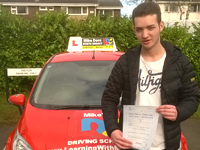 I benefit from block lessons and by booking this with Mike it enabled me to pass within 4 months. I always looked forward to my lessons with Mike because even though he was a male I found him approachable and easy to get on with. At the end of my lessons I found myself repeating his famous quotes back to him, which was rather funny. Mike was able to put up with my emotional journey of getting stressed and moaning 24/7 and deserves a reward. 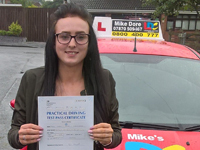 I passed second time but was constantly reassured by Mike when it knocked my confidence. I would recommend Mike to anyone, thank you for everything! Mike was a great driving instructor for me and always stayed calm and collected throughout my time with him. One of the biggest things I like about learning with mike was he allowed me to learn things myself, he'd let me make mistakes and then learn from them. This approach to driving means that everything he has taught me when it comes to driving has stuck with me and I will remember forever. On the subject of remembering something forever, his little sayings and phrases will always stick with me, and I use them every time I'm driving. Mike always put me first when it came to our lessons, what I wanted to learn or practice, when I was available, even with a busy schedule he always made time for me and made sure that it was convenient for me. 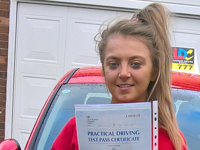 I would recommend the semi-intensive course that he offers to any new driver with no or little driving experience, I found it the best possible way I could learn to drive and it meant I felt ready and confident to do my test and pass first time. I am going to miss having my driving lessons with mike, he was more of a friend than a driving instructor as the time went on and he became someone that I enjoyed spending time with. I now am the proud owner of a car and I am enjoying the freedom and possibilities this opens up for me. Thank you Mike! 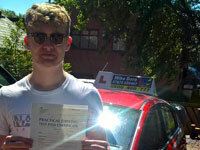 Congratulations to Ferenc for passing his driving test with only 6 minors. I would highly recommend Mike as a driving instructor. First of all he is more like a friend than a teacher, he looks at exactly what you're struggling with and finds out a way to deal with that. I came to Mike with no other driving experience and felt at ease. He has famous sayings that you will remember for the rest of your life, and that help you while you're driving. He is willing to change lessons to fit when you can and can't drive and prioritises what you need most in your lessons but also finds out what you want to do. He will let you make a mistake if its safe, so that you will remember it and not make the same mistake again. As the weeks went on I looked forward to my lessons with Mike. He never got angry or raised his voice, he stayed calm. I passed second time and after failing the first time he made me feel like I was a safe driver and it was my nerves that got the better of me. I will miss my lessons with Mike but thanks to him I bought my first car and i'm on the road as a confident and safe driver. I would recommend him to any new driver! Thanks for everything Mike! 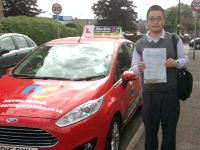 Congratulations to Richard G for passing his driving test. 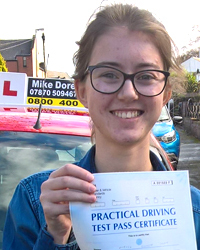 When I first came to Mike for driving lessons I had never sat in the driving seat of a car, so was very anxious about everything involved with driving and struggled initially to even get on the roads. Mike was very patient with me; he got to know me and how I think, and tailored the lessons and his teaching methods around this. He made me feel at ease in the car and my confidence grew from lesson to lesson. I was happy to pass my first time, but am sad that I won’t hear more of his famous phrases - I will never forget “she who hesitates is lost” as I get to a roundabout or junction. Many thanks to Mike for everything! Firstly Mike is a genuine, friendly and lovely person who is pleased to have his customers and makes you feel appreciated and not just another number. He is keen to get to know you as a person to see how you think and learn best, to adapt his teaching skills to you personally. 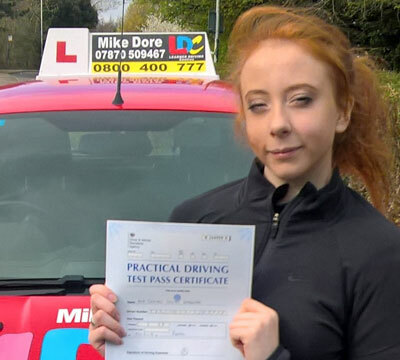 When I first started to drive I was very unsure of myself and a little bit scared but within a couple of lessons with mike I started to enjoy it as he made me feel very comfortable and at ease. We all make mistakes at first but mike was there to control the situation and made me feel calm instead of panicking and stressing out if I did made a mistake, he would point out why it went wrong and what I should do next time t stop it happening again. Even when I failed my first two tests he made me feel better about myself and told me to not let it get me down because I was a good driver and I was just letting my nerves get the better of me. He also gave me some advice about concentrating on my breathing to help my nerves which helped a lot. Mike is also very flexible and helpful and will change lessons for you within reason if it is possible and not too short notice. 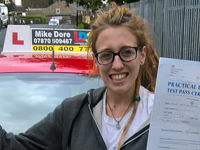 I did the semi intensive course which I do recommend if you are a beginner and want to save a little money, also I found once I had paid it I didn't have to worry about money and could just concentrate on the driving. I definitely chose the right instructor for me and would recommend him to other unsure beginners. Thanks Mike I really enjoyed my lessons and wish you all the best in the future as an instructor. 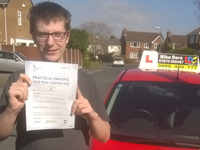 The reasons I would recommend the instructor Mike Dore; Reliability – always on time for lessons. Flexible – He is willing to change his normal schedule to accompany your needs where possible. System – Mike stresses the importance of observations e.g. Roundabouts. Mentality – Although I’m not affected much by atmosphere, I know many people require a calm working environment and Mike provides this consistently even if you do a drastic error, this dovetails into a tendency of Mike’s, Mike will intentionally let you make a mistake (e.g. insufficient steering leading to entering other lanes or too being too quick on approach) if it is safe to do so, this makes the incident very memorable making it unlikely to occur in the future and also improves your ability to correct mistakes, this skill is vital. Adaptability – Each learner learns differently and Mike quickly adapts, for example(s) You may need; prompting throughout, prompting at times or no prompting (only when something goes wrong). The level of guidance you need may vary over time and Mike will tailor the lessons to assist you making the process efficient. Mike will also ask what you want to do on the lesson, you are not confined to follow a set lesson structure. Difficulty – Mike will gradually increase the difficulty of the roads to keep you constantly improving instead of stagnating (e.g. moving onto main roads when he believes you are ready). – The clutch is very forgiving to beginners. The only way you will stall it is sizable errors with clutch e.g. When on a hill raising the clutch if the car remains stationary or rolls back instead of using gas, it will sometime make it (depending on the hill) I have tried to articulate all the reasons I can possibly think of, at this time, if you have any concern just message him and he will get back to you, he is always happy to help. Thanks Mike. 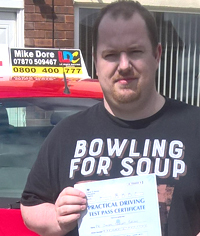 When I started learning with Mike, I was very nervous and didn't think that I would ever be able to pass my test. I was very nervous and got worried quite a bit. Mike worked with me calmly and patiently, without getting stressed or angry. This was what I needed to be able to pass my test. I was able to learn in a calm environment without too much stress. Mike was always very kind and professional and I would recommend him to anyone thinking about learning to drive. After coming from another instructor, Mike helped me realise I needed to improve my observation and decision making skills especially at roundabouts, Mike was patient with me and helped me build up confidence. The time in the car was always a good laugh and was something I looked forward to. The little red ford fiesta has easy and smooth controls and is very forgiving; I somehow managed to do a hill start at a junction in 2nd gear without stalling on my test. When I went to take my test Mike told me to treat it as just another day driving with him rather than being nervous about what could happen, that's what I did and I passed first time with 5 minors. I felt I had enough confidence to be driving on the road alone that I have since bought a car and I am picking it up just 4 days after passing my test. I passed my driving test after learning with Mike. I couldn't have asked for a better instructor as Mike was an encouraging, patient and constructive instructor who made lessons fun and enjoyable. 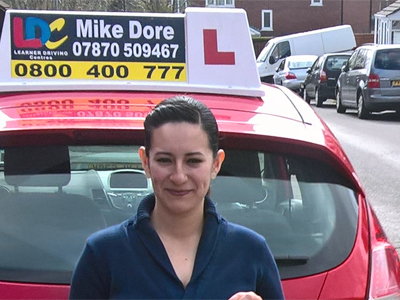 I started with Mike as a nervous and inconsistent learner driver, but after each lesson my driving confidence grew and consistency improved. Thank you Mike for helping me to pass my test. 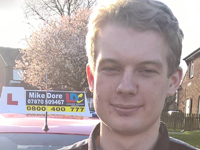 Mike has been a great driving instructor; he always makes sure you get the most out of the driving lessons and gets you in the driving seat as much as possible. I passed through the semi-intensive driving course. 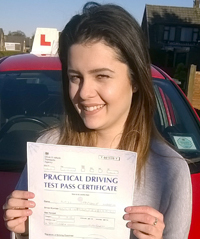 I would recommend this course as it is very flexible and helped me develop my driving skills and confidence quickly. The 2-hour sessions are great as you get a lot of time in the car and also gain confidence and improve your skills. Mike is very friendly and patient. He is very understanding of your individual needs so you get the most out of each lesson. Mike is very flexible and approachable and I always had a quick response time when contacting him. I have thoroughly enjoyed my lessons, thanks again Mike it’s been a pleasure. First of all thank you so much for all lessons. These three weeks passed too quickly but two weeks lessons were fantastic. I passed my test in first attempt with 9 minor faults and I’m so happy about this result. Mike is a good teacher and also he is so friendly, helpful and a good listener. He provided me with very good moral support. 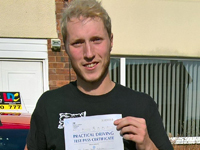 I passed the driving test using the LDC Block Booking 10 hourly Driving Course with Michael, and he was an absolute pleasure to drive with. Many thanks once again for all of your help and guidance during our lessons over the past two weeks, it has helped me a lot in making good steady progress over such a short space of time. 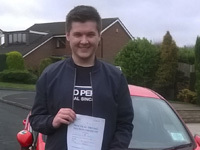 I am glad and delighted that I was able to pass the test today on my first attempt with only 3 minor faults, and I wouldn't have been able to do so without your advice and support. 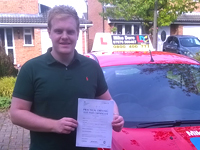 Michael is friendly, approachable and a reliable driving instructor. He is very flexible with lesson times over short periods and also provides very good moral support. 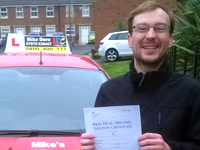 I passed the driving test using the LDC Midway Pass Course with Michael, and he was an absolute pleasure to drive with.